For hundreds of Iraqi families fleeing the violence ravaging their country, the primitive displacement camp near the Syrian border town of Rajm al Salibi meant they had escaped the merciless grip of Islamic State and were poised to enter the relative safety of the Kurdish-controlled province of Hasakah. But at dawn Tuesday, at least five Islamic State jihadis donning explosives vests snuck into Rajm al Salibi, near the town of Shaddadi in Hasakah. Some struck the nearby border checkpoint, manned by Kurdish forces, while the rest blew themselves up near the hundreds of civilians sleeping in a makeshift camp nearby. The attacks, the Syrian government and Kurdish activists said, killed more than 46 people and wounded scores of others, the opening gambit in a multi-pronged Islamic State offensive against the militiamen of the Syrian Democratic Forces, a Kurdish-dominated faction that is supported by the U.S. The Syrian Observatory for Human Rights, a pro-opposition monitoring group with a network of activists in Syria, put the death toll at 38, including 23 civilians, a number of them women and children. It said the death toll was likely to rise. Amaq, a news agency affiliated with Islamic State, quoted a security source from the group who said 16 inghimasis — militants who fight until they run out of ammunition before detonating their explosives vests — had attacked four Kurdish positions in Shaddadi, including the checkpoint in the perimeter of Rajm al Salibi. 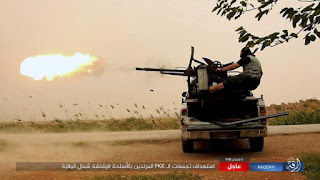 Other jihadis had attacked with heavy artillery and Grad rockets, the source said. The official Syrian Arab News Agency said that as many as 34 civilians had been taken to hospitals in Hasakah city, more than 30 miles away, and that the bodies of the dead had been left in the camp. Garofalo said the border crossing is frequented by thousands of people from Mosul, Iraq, currently the site of a large-scale U.S.-backed campaign against Islamic State, as well as Syrians fleeing from the eastern desert province of Dair Alzour, which is under the jihadis’ sway. Many Mosul residents have escaped to the nearby Al Hawl camp, which hosts 17,000 people. The attacks came as fighters from Syrian Democratic Forces were clearing the last jihadist positions in Tabqa, a city about 27 miles west of the Islamic State’s de facto Syrian capital, Raqqah. The taking of Tabqa is seen as an important milestone in the long-awaited offensive to remove Islamic State from Raqqah. The Syrian Democratic Forces are the prime recipient of U.S. support in Syria. Their fighters receive air cover from the warplanes of the U.S.-led coalition, and special forces operatives fight alongside the militia on the ground.